As the number of Americans on food stamps grows, so, too, do fraud and abuse. 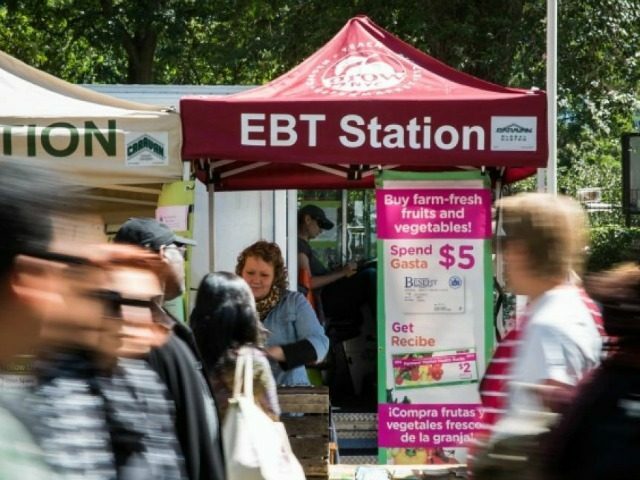 Food stamp “trafficking,” in particular, has grown so much that 140 stores in Chicago’s inner city have been cited for food stamp fraud, many of them shut down as a result. With African Americans suffering badly during the Obama administration, the number of Americans on SNAP, or the Supplemental Nutrition Assistance Program, is at an all-time high, having increased by around 19 million Americans since Obama took office. According to the National Review, the number of black households on food stamps has risen 58.2 percent since 2008. And while the U.S. government has been cracking down on fraud and abuse, store owners are still tempted to illegally exchange cash for food stamps. Typically, store owners will give SNAP holders fifty cents on the dollar in cash while redeeming the food stamps for the full amount with the government. While recipients may be losing a portion of their benefits by “trafficking” in food stamps, having the cash allows them to use the money for illegal purchases like drugs. “We see a lot of it. It’s a major problem. It’s our tax money that’s basically funding these criminal operations,” Assistant State’s Attorney David Williams told the Chicago Tribune. But the money is also useful for legitimate expenses like rent, electric, and other bills for which SNAP cannot be used. And with the real median income among black households falling nationwide from $35,945 to $35,398–a 1.5 percent drop since 2014--the extra hard money is often welcome. Along with the crackdown, some inner city stores are finding themselves caught in criminal operations. A new report in the Chicago Tribune reveals that the temptation has been too much for a large number of inner city stores to resist. More than 140 stores in Chicago and another 34 in the nearby suburbs have been sanctioned for food stamp trafficking. The sanctions usually include the store’s loss of the right to participate in the SNAP program, and since up to 80 percent of their business is done via SNAP benefits, the sanctions often result in the store’s closure. Chicago’s Regional Organized Crime Task Force has been successful at strengthening penalties for stores and those who traffic in food stamps. State’s Attorney Williams noted that the problem is “fairly rampant” among corner stores in the city. The crackdown has created empty storefronts and fewer shopping options in parts of Chicago, as most disqualified retailers were corner stores in low-income predominantly minority neighborhoods on Chicago’s South and West sides. In those neighborhoods, a store getting booted from SNAP effectively means getting shut down. Some SNAP advocates say corner store trafficking represents a symptom of a much larger problem–deeply entrenched poverty exacerbated by poor schools, nonexistent jobs, scant business development and years of neglect from all levels of government.